If I had to pick Logan’s top three favorite foods right now, it would without a doubt be mac + cheese, watermelon, and blueberries. Which is why in celebration of my first baby turning two (still wrapping my head around this one) we spent the weekend leading up to his birthday (it was on a Monday this year) eating/doing all of his favorite things. Starting with breakfast, he had watermelon slices followed by blueberries! 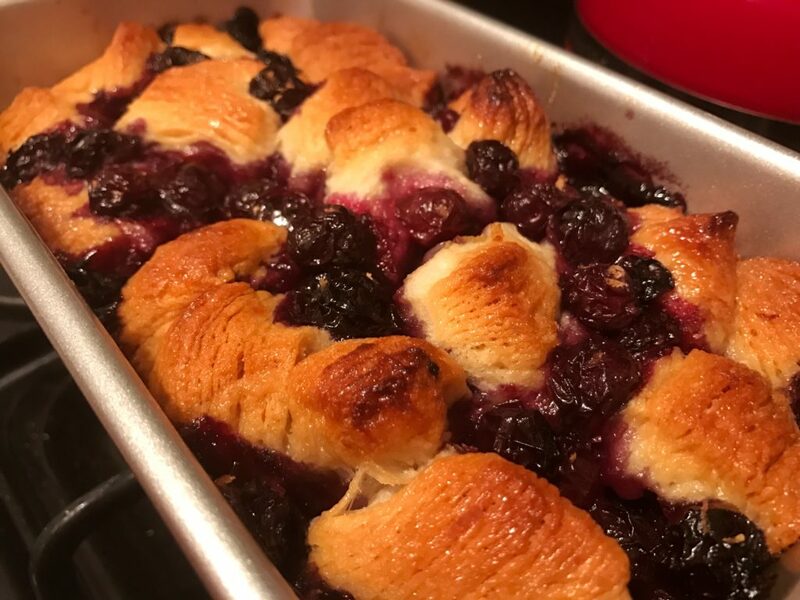 I mixed things up a bit by making a blueberry lemon pull-apart bread that was just the right mixture of sweet + tart. This recipe is super easy to throw together and makes a big impression — perfect for those hectic mornings when you’re strapped for time, but feeling like a little something extra. Another plus, it’s got two cups worth of blueberries and only one-fourth cup sugar! Separate dough into 8 biscuits and cut into quarters. In medium bowl, combine melted butter, lemon juice, and vanilla. Coat dough pieces in butter mixture. When all pieces in bowl, allow to sit for five minutes to soak up the liquid. Pour sugar into large ziploc bag, add dough pieces, and shake to thoroughly combine. Using butter bowl (the less dishes, the better! ), combine blueberries and lemon zest. Grease a 9 in. bread pan and place a layer of dough, then top with 1/2 blueberries. Add last layer of dough and squeeze remaining liquid out of bag and into pan. Top with rest of blueberries. Bake for 50 minutes. Then take out and cover with foil and bake for another 5-10 minutes. You’ll know it’s done when you gently pull up a piece of the dough and it’s cooked through. Enjoy!